Take this GREAT quilting class and learn useful techniques from one of our favorite local quilting teachers. Michelle is fantastic at teaching quilting to beginners (and her bindings are amazing!). This is a beginner friendly project introducing skills to piece a quilt top onto a foundation of batting. Straight stitch piecing is easy and fun. Once your “blocks” are covered you will trim them and sew them together and add a border. Place the top onto your backing fabric, “stitch in the ditch,” machine bind and your table runner is done! The Quilt-As-You-Go project is easy to learn and will quickly become one of your favorite patterns. You can make a table topper, table runner, pillow top...or go for it and make an entire quilt. You must know how to use your fully working sewing machine. Sewing machine in good working order with a ¼” foot for piecing and a walking foot for quilting. Thread, pins, scissors, rotary cutter and acrylic ruler for cutting strips. 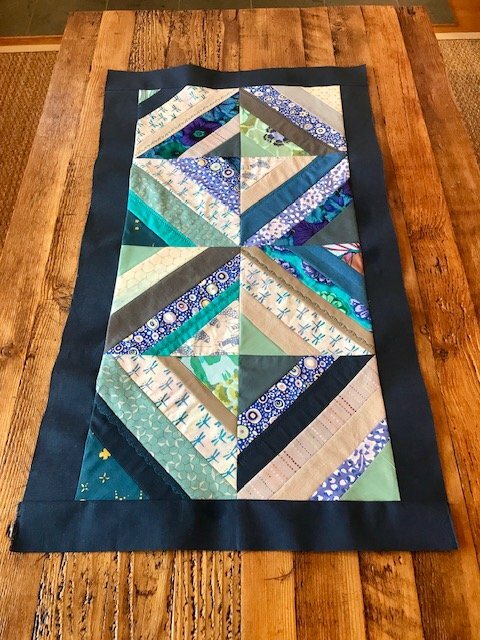 Scraps from your stash, 6-8 fat quarter cuts or a jelly roll to cut strips varying in width from one to two inches wide and 12 to 16 inches long. For the boarder, you will need 1/3 yard of fabric and 1/3 yard of medium weight iron on stabilizer. For the backing and the binding you will need a total of one yard of fabric. Optional: 9 ½ inch square acrylic ruler.